A short blog post today to tease a little bit about our future theme changes that are going to land in Ubuntu Artful as we are transforming our default session. For more background on this, you can refer back to our decisions regarding our default session experience as discussed in my blog post. As I’m in the Eurostar1 heading back home from the Fit and Finish Sprint, let me quickly write up how excellent this session has been! Once we got over some physical dimmed screen display issue and Will encouraging me to fix this using manual and antic technology, we fought over some cables dilemma to display our default GNOME Shell theme. We then have been able to project it and incrementing all together over it. 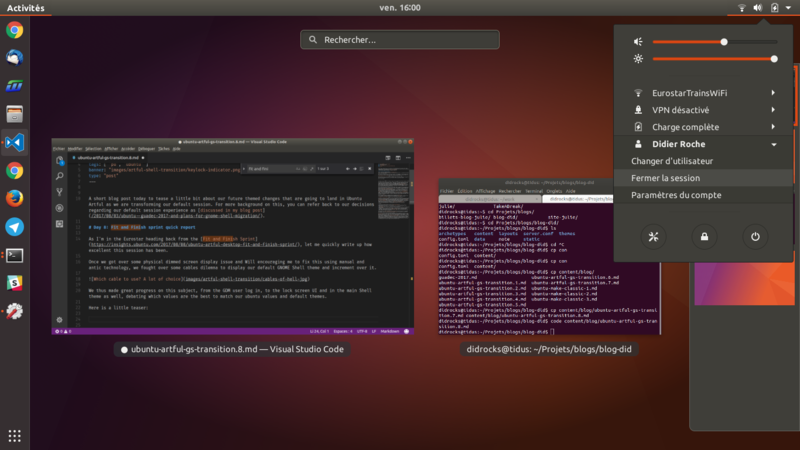 We thus made great progress on theming: from the GDM user log in, to the lock screen UI and in the main Shell theme as well, debating which options are the best to match our ubuntu values and default theme. Those themes are only compatible for Ambiance right now, and are based on GNOME Shell 3.24. We will rebase it on 2.26 once uploaded to the distribution (probably on 3.25.91). We also got a bunch of other bug fixes around the GTK theme itself and many design discussions around various Shell desired behaviors. As you can see, the list was quite large!